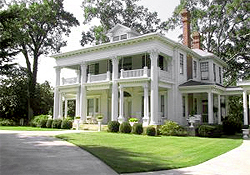 A Bed and Breakfast Inn is a type of boarding house typically operated out of a large single family residence. Guests can be accommodated at night in private bedrooms (which may or may not have private baths) and where breakfast is served in the morning. The business may be operated either as a primary occupation or as a secondary source of income. The staff often consists of the house's owners and members of their family who live there. Cut 8 asparagus spears 4" long for garnish. Cut remaining pieces into 1/2 inch lengths using only the tender parts of the stalks. Boil 1 quart of water in a large saucepan, add salt and all the asparagus. Brush bottom of pastry shell with egg white. In a bowl combine the asparagus, Swiss cheese and bacon, mix gently. Place in the pastry shell. Bake, uncovered, at 400 degrees for 35-40 minutes or until a knife inserted near the center comes out clean. Arrange the asparagus spears spoke fashion on top of the quiche. Place the cherry tomato halves in between the spokes. Serves 6-8.